The monumental Cathedral of Christ the Light has graced the shore of Lake Merritt in Oakland since September, 2008 but I only recently had a chance to visit. After hearing the name of the architect – Craig Hartman – two or three times in casual conversation in the last few months, it seemed like a good time to look at the work of a living architect for a change. Hartman, design partner at the San Francisco office of Skidmore, Owings & Merrill LLP, has used glass, steel and other materials typically associated with the skyscrapers his firm is known for, to create a luminous and grand cathedral. The aptly named Cathedral of Christ the Light sits like a shimmering cone and is the focal point of a large plaza with other diocese buildings and a green space. It is another architectural must-see in the East Bay, along with Bernard Maybeck’s First Church of Christ, Scientist, Julia Morgan’s Berkeley City Club and Timothy Pflueger’s stunning Paramount Theatre a few blocks away. The commission of a cathedral is an especially rare one for most architects. The last cathedral built in the Bay Area was St. Mary’s, formally known as the Cathedral of St. Mary of the Assumption on Gough Street, completed in 1971. Its washing machine-like agitator steeple is a distinct presence in the San Francisco skyline but the interior has always seemed dark and uninviting to me. 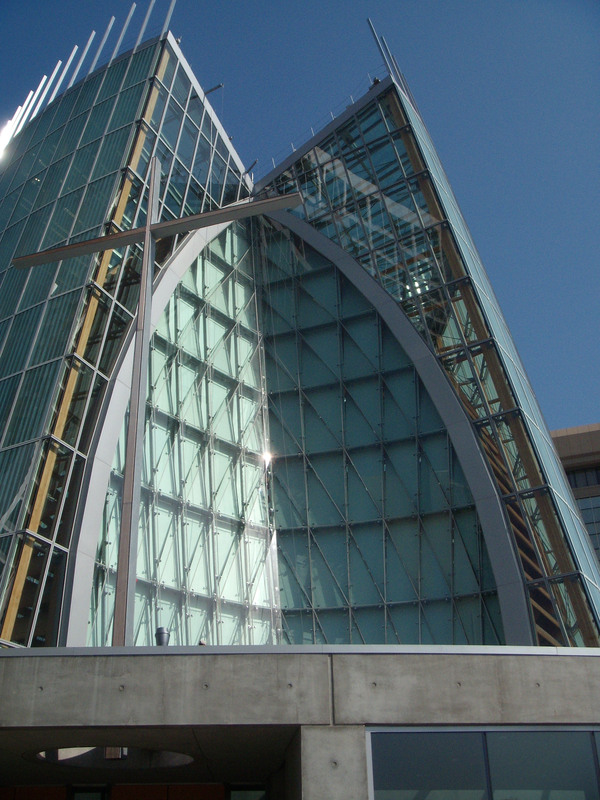 The Cathedral of Christ the Light was commissioned by the Diocese of Oakland after its neo-Gothic Cathedral of St. Francis de Sales was irreparably damaged in the 1989 Loma Prieta earthquake. The diocese held an architectural competition, and initially awarded the job to Spanish starchitect, Santiago Calatrava. But in 2003, Calatrava withdrew from the project, and the runner-up, the design by Hartman, was selected. Hartman, who spoke with me for an article in the Wall Street Journal, said one inspiration was the way Le Corbusier used light in his famous chapel, Notre Dame du Haut in Ronchamp, France. After studying abroad in London while attending Ball State University’s then-nascent College of Architecture, Hartman made his own pilgrimage to see the iconic chapel. He hitchhiked to the village of Ronchamp to see Le Corbusier’s modest chapel of reinforced concrete, with its sloped roof and thick concrete walls, punctured with squares and rectangles to let in the natural light. “I was stunned to see the way light was introduced to the space, and with very modest materials,” Hartman recalled. Light and space play a big theme in all of Hartman’s work, from his office towers in San Francisco, the International Terminal at SFO, an urban plan for Treasure Island, and his much-lauded U.S. Embassy in Beijing. Light is a major component of his cathedral, as if it were another building material. The result melds the historical, traditional and contemporary, as architect and client sought to build a 21st century cathedral, with some vestiges of tradition. The cathedral also evokes some images of the medieval Chartres Cathedral, an hour south of Paris, renowned for its long, tortured history, its mismatched spires and ornate stained glass windows, which were removed and spared from the bombings during World War II. Chartres crowns the top of a long winding hill above the small city of Chartres. Oakland’s cathedral is at the crest of a slight elevation, where a long, straight ramp, called the Pilgrim’s Path, leads from the sidewalk on Harrison Street to the formal entrance at the south end. 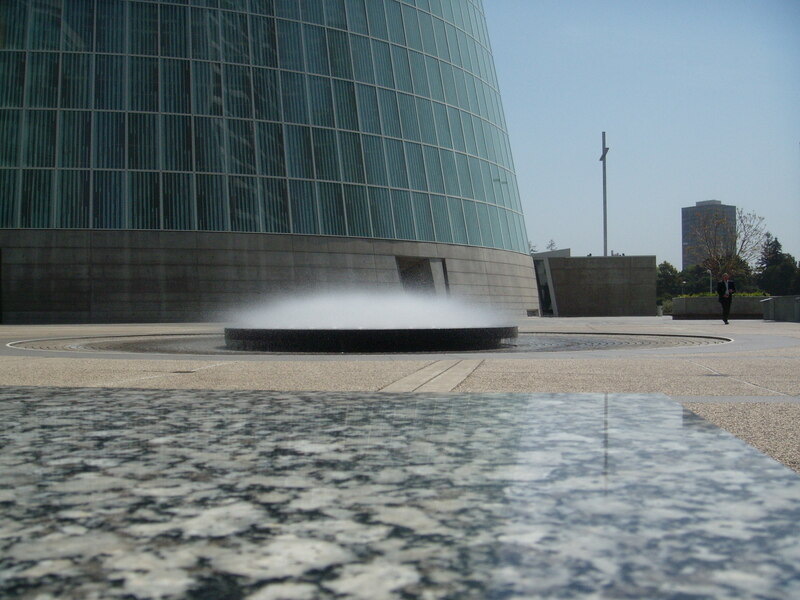 Stepping inside the grand doors, a huge, round baptismal font of dark granite also acts as a vessel for holy water, echoing the lake across the street. The cathedral is aligned with Lake Merritt and the moving sun, the interior capturing every angle of light. “It’s almost like a kaleidoscope,” said Rev. Paul Minnihan, the Cathedral’s provost, as he gave me a tour. The presence of light can be stunning, depending on the time of day. The interior of the sanctuary is framed by 26 ribs of curved Douglas fir, 110 feet high, and 768 fixed slanted louvers, which flood the interior with light. The northern wall, called the Omega Window, has a digitized version of a sculptural relief of Christ in the Chartres cathedral. The image comes through a series of aluminum panels that have 94,000 punctured holes of varying sizes letting in different degrees of light. 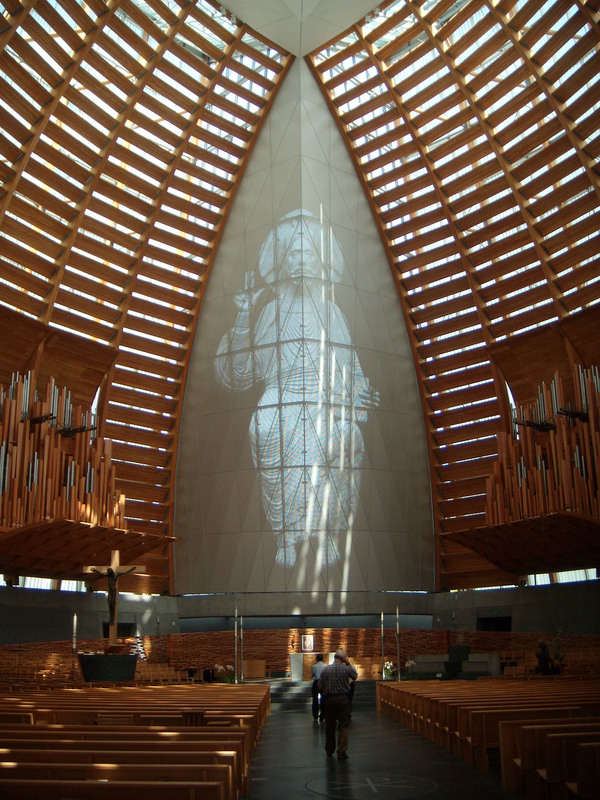 The image of Christ looms 58-feet high like an apparition and appears darker or lighter, depending on the time of day. It can even been seen in the evening, as the cathedral, lit from inside, glows. The hologram-like image of Christ is both a 21st century interpretation of a medieval work of art and another homage to the Gothic cathedral. 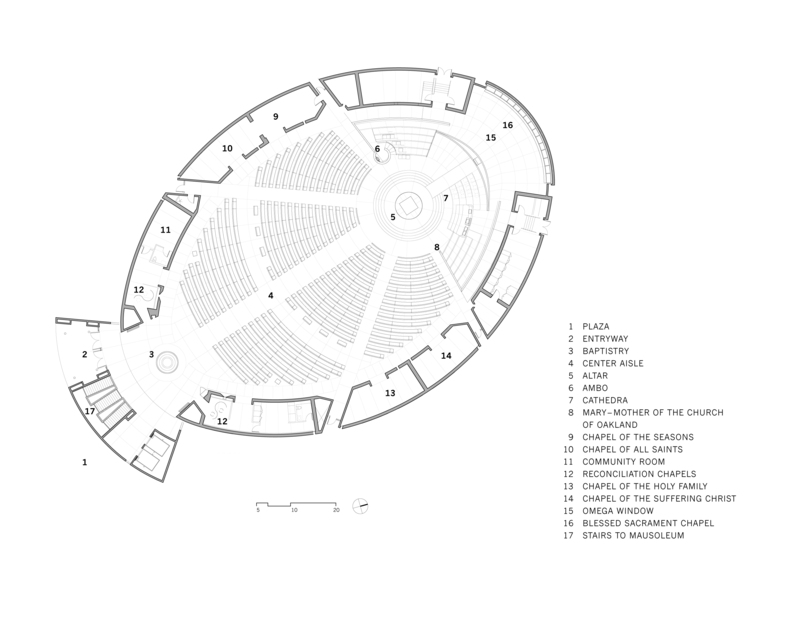 However the floor plan of the sanctuary, which seats 1,350, is not the standard cruciform pattern. Hartman wanted a modern approach versus the traditional hierarchical form used by Gothic church builders, where the congregation faces the altar. “The idea here is to have the altar in the center and have the congregation around that,” he said. After Hartman was chosen for the cathedral, he consulted with Walter Netsch, one of his mentors from his early years working at SOM’s Chicago headquarters. Netsch had a big influence on Hartman’s career. As a young student in the late 1960s during a visit to the U.S. Air Force Academy, it was seeing one of Netsch’s most famous works, the radical Cadet Chapel and its soaring row of triangular spires in Colorado Springs, Colo., that inspired Hartman to consider studying architecture. “The amazing circle of life, I suppose,” he said. The geometry of circles, spheres and squares plays a role in his design. The sanctuary design refers to the intersection of two overlapping spheres, known as vesica piscis, an ancient symbol for Catholics and other faiths, representing Christ, the congregation, procreation and the basic symbol of Christianity, the fish. The new cathedral is also home to many artifacts of the now-destroyed St. Francis de Sales, reminders of the heritage of the Oakland Diocese. 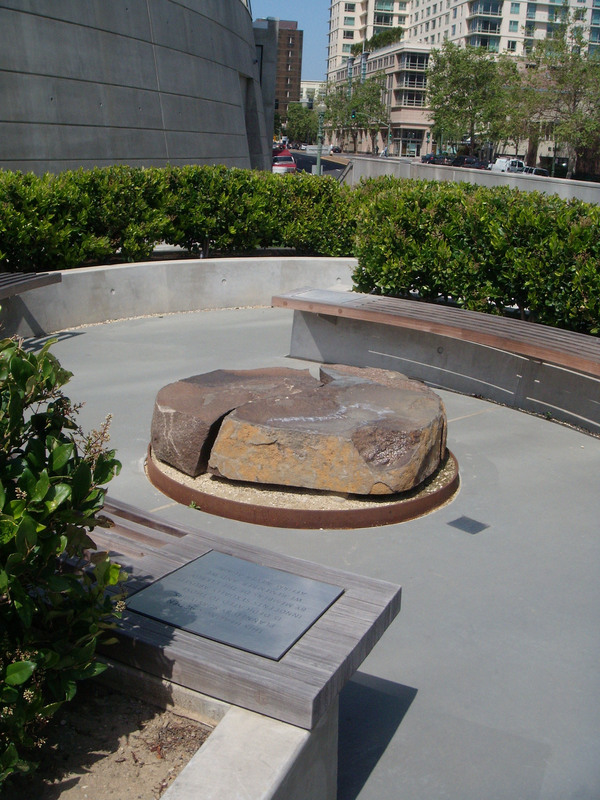 One is the cornerstone of the original cathedral, inserted into the new cathedral. Another is a mosaic from St. Francis de Sales, now the centerpiece in the Hall of Honor where the new cathedral’s benefactors are recognized. In the mausoleum below the cathedral, the altar from St. Francis has been repurposed into a catafalque, where a casket or urn is placed during final prayers before entombment. A soothing waterfall trickles as visitors enter. Several stained glass windows, including one depicting St. Francis de Sales, the patron saint of the diocese, were also saved and now adorn the crypt areas. You don’t have to be religious to appreciate Hartman’s Cathedral of Christ the Light. While there are many references to the theological, the mystical and the ethereal, it is also a celebration of the here and now, of life. Previous Post Hibernia Bank dome graffiti-free again! The Cathedral of Christ the Light is the last of the 20th century cathedrals/churches, infused with chilly, bleak light. Theatre-in-the-round Catholic churches such as this have been around for 50 years, are almost always ugly and are inappropriate liturgically and theologically. Hartman’s focus on creating a community meeting place, as opposed to a majestic, sacred space, is hardly new. He has merely joined the long line of neo-Protestant Catholic designers who have torn the guts out of old Catholic churches and designed hideous, new churches over the past 50 years. Christ the Light is the last (expensive) gasp of that horrible, old trend that has peppered the landscape with churches resembling water treatment plants and bowling alleys. Look around anywhere – you’ll see one soon. However, the trend is finally dying, and we are seeing a return to alignment and design of church buildings that properly reflect their primary purpose – the worship and glorification of almighty God. What a great web log. I spend hours on the net reading blogs, about tons of various subjects. I have to first of all give congratulations to whoever built your theme and intermediate of all to you for writing what i can only describe as an incredible article. I honestly consider there is a ability to writing articles that only a few posses and honestly you got it. The combination of enlightening and quality content is decidedly highly uncommon with the large amount of blogs on the cyberspace. Hi sorry about that I have a PC! But also I notied the blog looks funky in Chrome as well. I don’t know if that is a WordPress issue or what. Thanks for visiting/reading anyway. I will have to try and figure this out.